Higher education policy expert in the Obama & Bill Clinton Administrations; senior fellow at at The Century Foundation. Views are my own. The way college graduation rates are measured is not perfect. But the claim that colleges enrolling a lot of part-time students are treated unfairly because these students are "overlooked" or "left out," as a recent article claimed, is pure bunk. The erroneous claim is not new. Officials at colleges with low graduation rates have for years defended their rates by falsely asserting, perhaps mistakenly believing, that their part-time students who eventually graduate are "counted as failures." With the federal government poised to reveal college comparisons that will likely include use of the graduation rate, it is time to set the record straight. Students who start college as part-timers are in neither the numerator nor the denominator of the graduation rate, so their existence on a campus has no effect on the calculation. They are not counted, period. The graduation rate is, quite logically, a measure only of those students who could, theoretically, finish in the prescribed amount of time because they started as full-time students. To be sure, more robust data on student success would be useful, such as the system developed by the California community colleges, allowing for much more refined analysis based on the characteristics and interim progress of the students. Even better would be a federal data system that allowed for a variety of analyses across institutions and states. But the current graduation rate measure is neither unfair nor fundamentally flawed. And it would not make sense to include part-time students in the rate as currently designed: Doing so would lower rather than lift the graduation rate, both because part-timers take longer and because fewer of them ever make it to the finish line no matter how long you measure it. Making sure students feel connected socially, so they feel that they're a part of the campus, that they belong. But policy makers need to be careful about placing too much value on a college's graduation rate, because there are some less noble ways that the number can be increased. One is to lower standards. The easiest way for a college to have a high graduation rate -- 100 percent -- would be to hand the sheepskin to every student who walks in the door. Of course, no college goes quite as far as being an obvious degree mill. But it is worth remembering that colleges themselves decide whether someone deserves a degree; we must trust that the people running the colleges will not make decisions that defeat the very purpose of the degree. A bachelor's degree is like the carrot hanging in front of the horse, a lure invented by society to encourage people to explore, to discuss, to question, to perform, to fail, to enjoy, to invent, to connect, to disappoint, to achieve. We rely on colleges to maintain the value of the degree by ensuring that it is conferred only upon a student who has traveled far enough academically to deserve it. Already there are a lot of questions about the skills of college graduates. We would be well-advised not to make it even harder to trust that colleges are maintaining the integrity of the degree. If we start paying colleges based on the number of degrees they hand out, it is not hard to imagine what will happen. Just look at how universities lower standards in response to the financial pressure to keep star football players from flunking out. Another danger is that colleges will shun needy students in favor of more academically focused, wealthier students. Given that most colleges already salivate over well-prepared and well-heeled high school graduates it is hard to see how highlighting the graduation rate could make that hazard worse. But it is a useful reminder to policy makers that a college may seem great because of the students who enroll rather than because of the teaching and support that the institution offers. For consumers, the fact that the rate may be high in part because of the students who enroll is no reason to dismiss the measure. Much the opposite. Peers can be as important a factor in student success as the inspiration that can come from excellent instructors and support staff. Because of the infectious nature of learning, it is not always evil for a college to make an effort to enroll a critical mass of well-prepared students, even plying them with scholarships. At community colleges, it is important to combine the graduation rate with the separate transfer rate, since transferring is one of the primary purposes of a two-year college. Four-year colleges also have the option of reporting a transfer rate, as explained in this useful article (full text available to Chronicle of Higher Education subscribers). While there is no single piece of information that adequately measures what a college does, the graduation rate is one of the more useful indicators available, despite its imperfections. Because of the apparent confusion about what the graduation rate does and doesn't measure, here is a brief tutorial using a four-year university and a two-year college in California. Determining a graduation rate requires choosing a starting group and a time period. To make the measure somewhat comparable across colleges, the U.S. Department of Education asks colleges to track the group of students who start in the fall as full-time students and who have not been enrolled before at any college. At Cal State Fullerton, for example, in the fall of 2012 there were about 9,000 undergraduate students who were new to the school. About half entered as transfers and another half entered without any previous college experience. A small number of students entered without the intent to earn a degree, and a few new freshmen entered as part-time students. 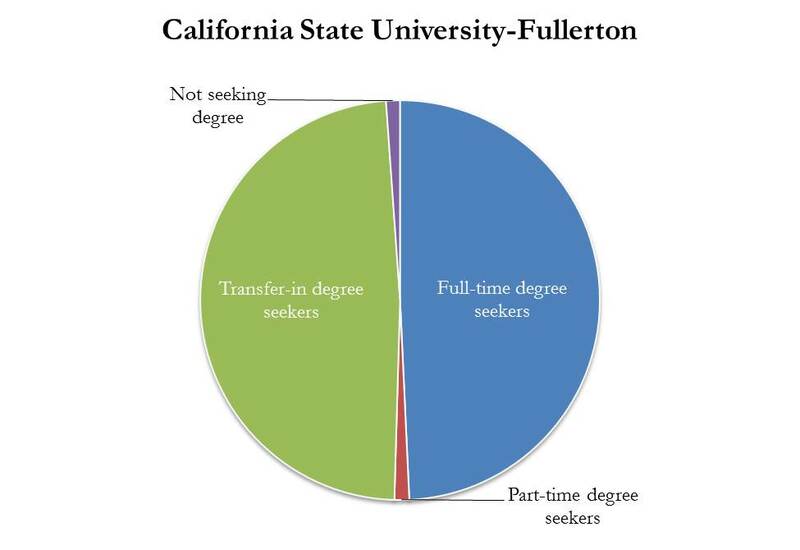 For the purposes of reporting its graduation rate to the federal government, Cal State Fullerton will be looking only at the students who started full-time as freshmen - the blue slice of the pie. After four years, Cal State Fullerton looks to see how many of those in the blue slice earned a degree from Cal State Fullerton. The school looks at this cohort again at the six-year, and eight-year point. The school may eliminate, from both the numerator and denominator, students who die or become totally and permanently disabled, or who join or are called to active duty in the armed forces or foreign aid (e.g. Peace Corps) or official church missions. We can use the group of students who started in 2004 to see how many of those who started as full-time students at Fullerton finished, and how long it took. 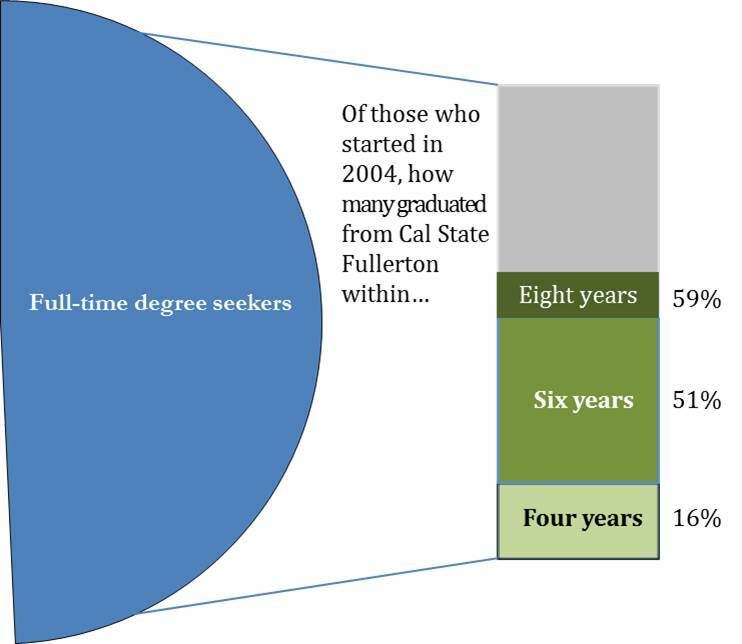 As the illustration below shows, 16% graduated from Fullerton within four years, an additional 35% finished between the four-year and six-year point (for a total of 51%), with an additional 8% after that, for a total graduation rate of 59% after eight years, for those who started there full time as freshmen. The student enrollment at a community college can be very different. There tends to be a greater mix in the age and backgrounds of students, more students who are not aiming for a degree, and more students who are enrolling in only one or two classes rather than in a full-time load (or they may be taking a full load split between two colleges). While the group of students starting in the fall at a four-year campus is usually half or more first-timers enrolling full time students (the blue slice), at the California community colleges the average is less than a fourth of the entering students, with a range in California from 4% to 50%. 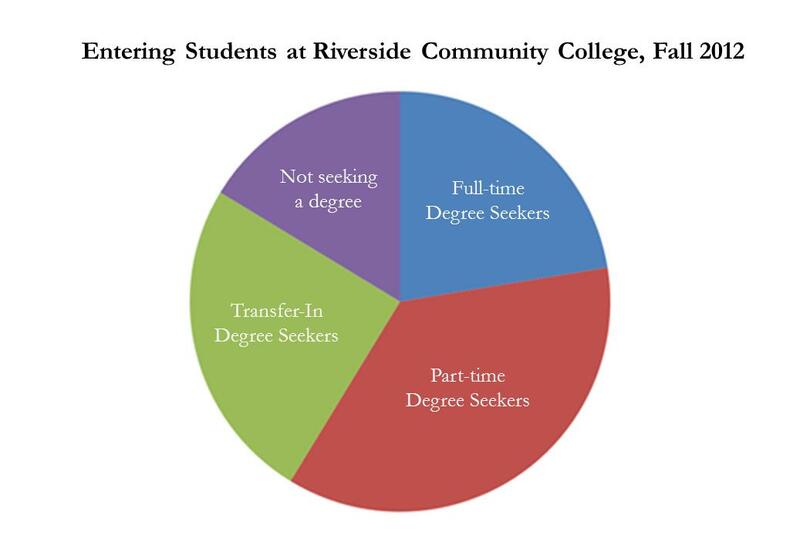 The pie chart below shows the distribution at Riverside Community College, east of Los Angeles. Appropriately, the federal graduation rate looks only at the students in the blue slice - the students who, presumably, are fully committed to getting a degree. But this is where calculating a graduation rate gets more complicated for community colleges. Students who want a four-year degree enter a community college knowing that they will be finishing at a different institution. Some of them may get an associate's degree along the way, and some of them don't. So the raw graduation rate is an inadequate measure. Fortunately, the federal government also asks for data on the number of those students who transferred. Adding together the graduation and transfer rates solves that problem. At Riverside, after three years 22 percent of those who started full time earned a credential (and may have also transferred), and an additional 24% of the students had transferred without a credential, for a total of 46%.